On this week’s update: warming up after the polar vortex, catching rocket parts for re-use, and Komodo a no-no for tourists. And making Komodo a “no-no” for tourists. First up… Parts of the USA and Canada are warming up again after temperatures plunged in January. In some places, it was minus 40 degrees Celsius – colder than Antarctica! The unusual weather was caused by a shift in the polar vortex, a kind of whirlpool of very cold air that spins around the Earth’s North Pole. In winter, the polar vortex tends to expand, and sometimes it also shifts and wobbles. In January, it spilled out over much of North America, for the first time since 2014 – causing extremely low temperatures. And sudden periods of cold weather are now much less common than they used to be. Next up… Sending rockets into space is very expensive, so companies like SpaceX want to cut costs by reusing rocket parts. First, though, they have to catch those parts as they fall back to Earth! And that’s where this boat, Mr Steven, comes in. Mr Steven’s huge net is designed to catch payload fairings. The payload is whatever the rocket is carrying – such as satellites. The fairings protect the payload for the first few minutes of flight, then fall off. The SpaceX team has been practising by dropping fairings from helicopters. But with each new fairing costing over four million pounds, it’ll be worth the effort! And finally… Do you know what makes Komodo, an island in Indonesia, so special? Komodo dragons are the largest lizards on Earth. They’re famous for their strength and venomous bite, and they bring a lot of tourists to Komodo. But now some people are worried that all those visitors are making the dragons weak and lazy! Instead of hunting their natural prey, wild animals such as buffalo, the local government claims the dragons have got too used to eating food left behind by tourists! Now, they’re thinking of banning tourists from Komodo for a whole year to encourage the dragons to get back into shape! In January, a shift in the polar vortex brought extremely low temperatures to parts of North America. However, scientists pointed out that winters are still getting warmer overall. Using a huge net on top of a boat, SpaceX has been trying to catch rocket parts in order to re-use them. 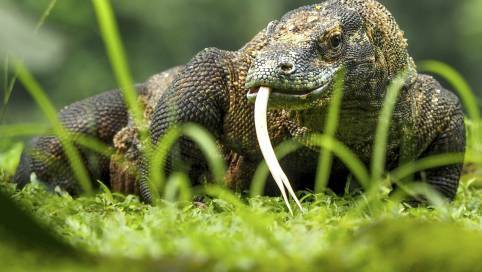 The government of Komodo is worried that its famous dragons are getting too used to eating food left by tourists, instead of hunting their natural prey. How do you think the extreme cold affected people’s lives? Have you ever experienced unusually hot, cold, wet or dry weather? How did you stay safe and comfortable? Why is SpaceX trying to catch payload fairings as they fall back to the Earth? Why do you think the payload fairings release parachutes as they fall towards the ocean? Imagine SpaceX has asked you to design an alternative way to catch the fairings. What would your design be like? Why is the government of Komodo thinking about banning tourists? What benefits might tourists bring to Komodo? Do you think the local government should ban tourists from the island altogether? Why or why not?